Rainfall in arid regions occurs in large and infrequent events throughout the year. Because the desert environment is a brittle one and because there is so much rain at one time, tremendous erosion occurs. This leads to the creation of scarps and wadis. 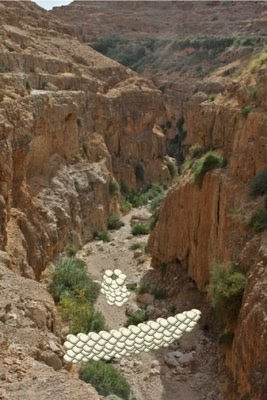 Wadi is simply the Arabic word for a riverbed. 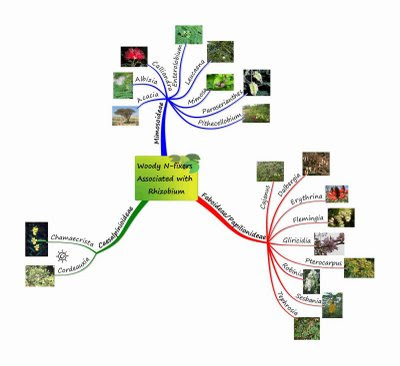 In an arid region, its water flow is likely to be ephemeral, particularly in headwaters (where permaculturists are most likely to be working). They are also places where a lot of erosion takes place. 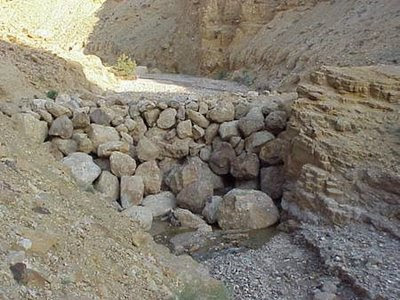 Looked at from another perspective, wadis are places where a lot of erosion can be stopped. After teaching a permaculture course in Jordan, designer Geoff Lawton returned to the area a year later and found that someone had built a gabion (an uncemented rock wall, usually held inside a steel cage) across a particular wadi. Although the 8-foot-high gabion was less than a year old, it was already full of settlement and still had water trickling out of the base, despite the fact that there had not been any recent rains. This natural tendency for gabions in wadis to quickly fill with water-retaining sediment provides us the opportunity to create what I am dubbing the Instant Wadi-Well (for lack of a better name). After determining where the gabion is to be placed, start with a shallow hole about 2 feet (60 cm) deep in a teardrop shape with the tapered end downstream. Place the first row of stones for the well inside the hole and cement them together, leaving the ground unmortared to allow water to seep in. Keep adding and cementing stones until you reach ground level. 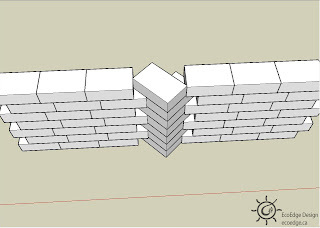 Once at ground level, continue up but add an extra 2 layers of mortared stone at the tapering end to allow stability in the face of the rushing torrent and sediment that is to come with the first rainfall. Continue this right up the entire height of the well shaft, making the top row at least 3 feet (90 cm) above the height the gabion will be. After all the sediment moves in, it is likely the well casing will only be 2 feet (60 cm) above the sediment. All that is left is to build the gabion. Wire cages are not absolutely necessary for the gabion to perform, but they are recommended as they make it far less likely that the rock wall will blow out in the face of the torrent of water, sand and silt. If the well casing is built strong enough, then there will likely be a well within a few major rain event is. The water will have to be tested as deserts tend to have salty soil. Baring salinity problems, this would be a quick and easy way to establish clean wells and combat erosion at the same time! This technique compliments other systems as well. For example, if there are storage tanks or cisterns at the top of the scarp, a windmill can be employed to pump water from the Instant Wadi Well to this higher storage. From there, it can be gravity fed down to where it is needed. 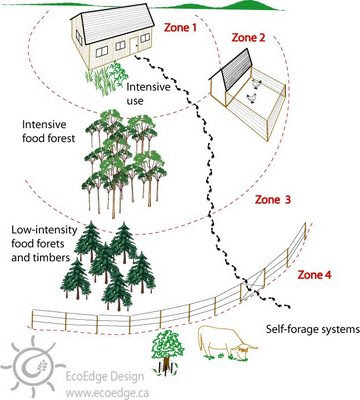 In the interests of saving people’s crops from raiding elephants, and to save the elephants themselves, one popular technique, widely taught and promoted in permaculture circles is the “Ha-Ha!” fence. The “fence” is actually a trench about 1.5 to 2 metres deep with steep edges to create a barrier that elephants cannot cross (so people with the fence can watch the elephants and say “Ha-ha!” as their crops are safe). In this way, farmers’ crops can be protected without having to harm or kill elephants. The drawback to this method, however, is that people have to put in considerable effort to dig these trenches out to protect their crops. Now, thanks to the ingenuity of a Thai villager, adopted by the Elephant Conservation Network (ECN) and the Zoological Society of London, there appears to be a simpler, less energy intensive method to deter elephants. The villager had strung old CDs along his fence in an effort to scare off the elephants. 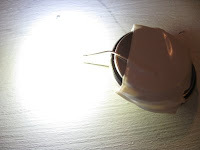 It was observed that, particularly during a full moon, “the CDs twisted and shone, mimicking a person with a torch.” It would be a simple matter to rig up a few throwie-type, battery-powered LED lights so that nights without the full moon would also have protection. This discovery is promising, but a follow up of the success needs to be seen. Elephants are very intelligent animals and could potentially figure out that the threat is merely a trick. But if it does work over the long term, it means a simple and cheap solution to crop-raiding elephants; and that is good news for people and pachyderms. The guidelines in this article are based on Art Ludwig’s industry-leading work. 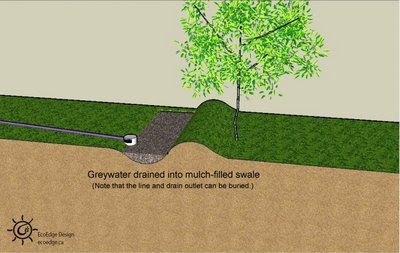 For further information on greywater systems, please refer to Ludwig’s Create an Oasis with Greywater, Branched Drain Greywater Systems, and Builder’s Greywater Guide. 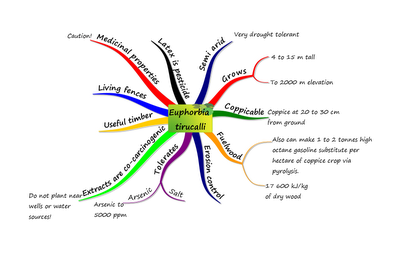 These are the best publications available regarding the construction of greywater systems. Conservation of water is rightfully a growing concern throughout the world. Less than 2.6% of the water on the planet is freshwater. Of that, about 69.6% is locked away in ice and another 30.1% in groundwater, including 13.5% in deep groundwater reserves over 800 metres underground. Only 0.6% of the world’s freshwater is immediately available on the surface via lakes and rivers; and only 0.037% is in the atmosphere at any one time. 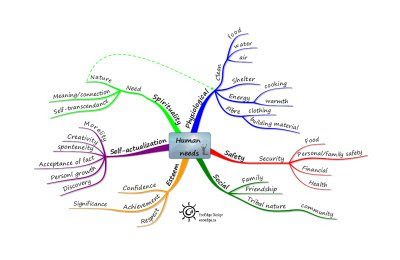 Industrial activity and industrial agriculture consume large amounts of the water that is available. And predictions for continental inlands forecast that global warming will bring drier conditions than those that currently exist. 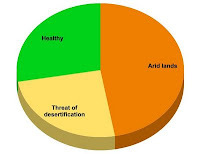 Of the total land mass of the Earth, 47.2% is arid, much of that converted to desert by human activity with a further 25% of the land at risk of desertification. And this problem is not limited to poor nations. While 66% of African lands suffer from desertification, 40% of the pastureland in Texas is now too arid for use. And pivot irrigation is turning patches of land on the Great Plains of North America into salted desert in 3 to 4 years. Even former patches of the Amazon rainforest are very close to becoming desert. Global water consumption is rising so fast that by 2025 demand will surpass availability by 56%. We need to shift to sustainable water usage, or we risk creating a planet largely comprised of desert. One way to use water more efficiently, and return it to the environment clean is by greywater systems. Greywater is waste water from homes from sources excluding toilets. It is water from sinks and drains containing small amounts of nutrient-rich organic matter. Household waste water typically consists of 50 to 80% greywater. 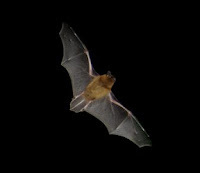 To flush this into a sewage system is a waste of life’s most precious resource. Irrigation by spraying is very inefficient with up to 80% of the water evaporating. This has lead to severe salinisation and desertification in some areas. Greywater drained into mulch or leach pits, on the other hand, has almost no evaporation and results in about 40% of the water being taken up directly by plants (the remainder is filtered by soil microbes before tickling down to recharge groundwater systems). Urban households can save the energy used to purify municipal water by not using tap water for watering plants. Rural households using pumps can reduce their energy and material needs by using greywater over well water for watering. Utilising greywater also extends the life of septic systems or reduces the load on municipal sewage treatment plants. And in areas where septic tanks are less practical, such as clayey soils and rocky areas where septic fluids cannot trickle into the ground, greywater can help tackle waste water issues. 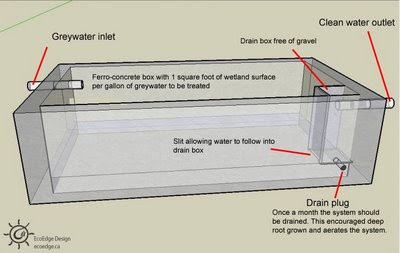 The use of greywater helps to recharge groundwater. Greywater systems need a certain amount of space. Not every site has enough land for the water generated from the home. Partial sites from only one part (one sink, for example) may be all that can be tapped for a greywater site. Very wet areas may become saturated with water. Such situations may be impractical or may require a different approach, such as greywater wetlands. Cold climates make outdoor greywater systems possible through the warm season only. Reduced water flow from a household can create a problem in urban areas with a municipal sewage system. It may be that the reduction in water flow through the pipes means that there is not enough flow to move toilet solids into the sewage main line. Many building codes have a lot of catching up to do when it comes to greywater. A system can be built with a diverter to the currently approved (i.e. unsustainable) system. The diverter can then be used to flow water into the greywater system once the code changes. This system can also be used to deal with freezing conditions mentioned above. Arid regions need carefully managed systems due to their inherent problems with salinity. Proper choice of detergents is important for every system but becomes vital in arid regions. 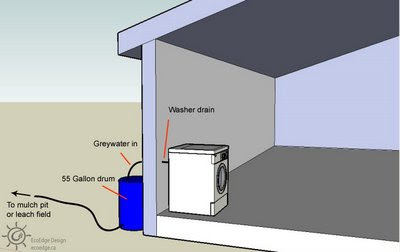 It is a good idea to incorporate rainwater harvesting systems with greywater, particularly laundry greywater. First-flush and/or tank overflow can be connected to greywater drains to wash away excess salts. An effective, safe greywater system slowly filters water through the soil so that microbes can devour the organic material in the water. The system should be designed such that people never come in contact with the greywater. 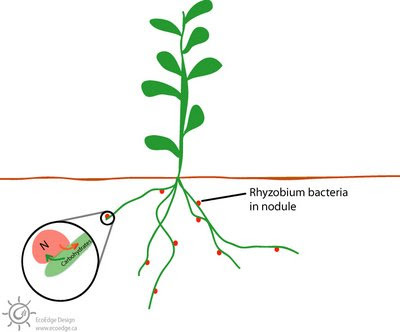 The systems can be used to assist food production, provided that the plants are not root crops. Don’t spray grey water on plants (or anything else). The water could contaminate the plant and contaminated water droplets could be inhaled. 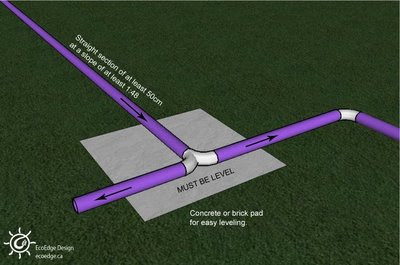 As a safety precaution, purple pipes are used in the construction of greywater systems, if possible. This colour standard is to avoid any accidental consumption. Don’t store greywater. It will fester dangerously. Also, design the system to keep water flowing. Systems that allow stagnation will convert relatively clean waste water into a health hazard. It is a good idea to design the system with a 3-way diverter valve so that greywater can be either directed into the greywater system or to the sewage system. In cold climates, this feature is a necessity. Greywater systems require a change in behaviour. Harsh household chemical cleansers will have to be substituted for greener alternatives. Consider the bedrock on the site. On a site with limestone, it is theoretically possible, however unlikely, to contaminate groundwater with a grey water system. Greywater systems are still possible, but the potential danger must be addressed in the design. Avoid perforated pipes for water distribution. First, they clog with sediments from the greywater. Second, even water distribution from the holes is next to impossible. Third, roots will surely clog the system. Dumping directly into a gravel bed system or mulch pit is much better, is simpler to design, cheaper to build, and cheaper and easier to maintain. Also avoid grease filters and other filtration systems. They will clog and they will clog quickly. If regular cleaning of messy and potentially toxic filters is a necessity of the system, it is likely that the user will stop using the system. Washers 115 to 190 litres per day. Good water quality. Bath tubs 150 litres per use. Good water quality. Kitchen sink 20 to 60 litres per person per day. Nutrient rich, but high in grease, soap and solids. Use drain screen. Shower 40 litres per person per day. Good quality. Use drain screen. Dishwasher 20 to 40 litres per day. Poor quality due to salt in dishwashing detergent. Bathroom sinks 4 to 20 litres per person per day. Good quality. 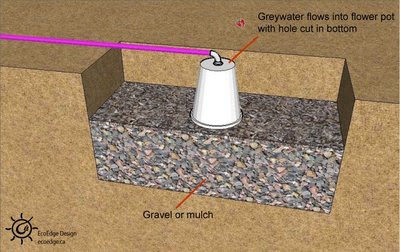 Perhaps the simplest, cheapest, most reliable, best performing greywater system is the branched drain system emptying to mulch pits or leach fields, created by greywater master designer Art Ludwig. 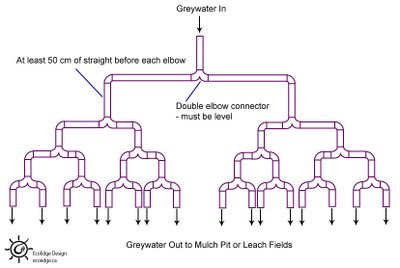 In this system, “double-elbow” pipe fittings are used to spread the flow of greywater to different areas of the garden. The branched drain system allows greywater to split into two paths up to 4 times. 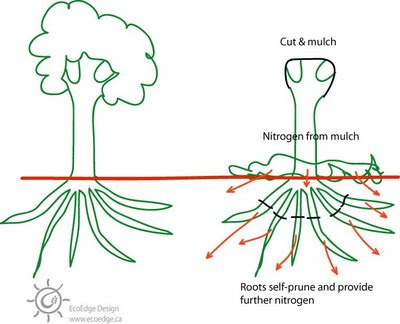 In other words, 16 drains to mulch pits or leach fields are possible in one branched system. Valves can be placed on each branch to allow that section’s flow to be cut off. The ideal place to do this is on the level section after each double elbow. This will prevent water from backing up and stagnating in the pipes. The elbow will effectively halve the flow, but you will need to ensure that the pipe leading up to the elbow has at least 50 cm (about 20”) of straight section. Also, the slope of the pipes should be kept at a fall of 1:48 or steeper to keep the water flowing. Whether a system is branched or not the ends can be hoses (flexible PVC is advisable as it does not look like a garden hose, thus people are unlikely to drink from it mistakenly), making them movable. This allows different areas to be watered. The advantage here is if one area becomes saturated, it can be shut off. The “gravity drum” system is ideal for draining washing machines evenly without surges in flow. This system will either have to be branched as above to deliver to a number of sites, or its drainage hose will have to be moved to avoid one location from becoming saturated. Greywater flows from the washing machine’s drainage hose into the top of a 55 gallon plastic drum. At the bottom of the drum, a hole is drilled and a coupling is added to fit a hose to drain the drum as shown. It will be necessary to put a small hole in the top of the barrel, or water will siphon out preventing the machine from refilling (wasting water and making the machine inoperable until the siphon is broken). Big-brand detergents can be very high in sodium, so it is best to choose a brand that has a low environmental impact. Only in tropical highlands would this extra sodium be beneficial, but only in small amounts. To address the sodium accumulation, it is best to combine the system with rainwater collection from the roof (or other surface as the case may be) to flush out the excess. 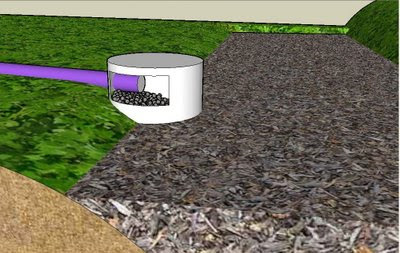 Greywater can simply be delivered into a mulch pit by placing the end of the pipe in the mulch. The diagrams below show a slightly more elaborate system that drain into a swale (a water-harvesting ditch on contour). Leach fields are another simple and safe way to distribute greywater. The diagrams below demonstrate one method to construct a simple leach field. 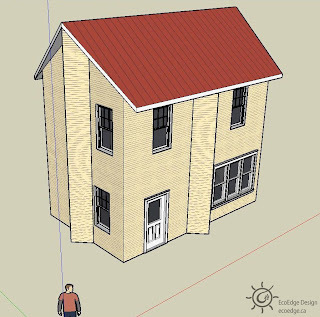 This design delivers simplicity and construction savings at the expense of a somewhat imprecise distribution of greywater. A trench 1 to 2 meters long and 40 to 50 cm deep is dug and partially filled with gravel or mulch. 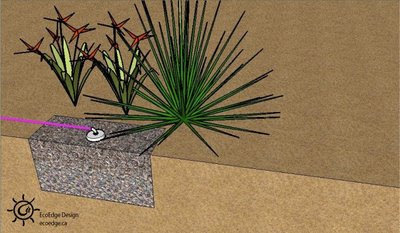 A hole is cut in the bottom of a clay or plastic flower pot and the greywater hose fitted to it. It is best to push to hose through into the pot and place a coupler on the hose larger in diameter than the hole in the pot. This will prevent the hose from pulling out. 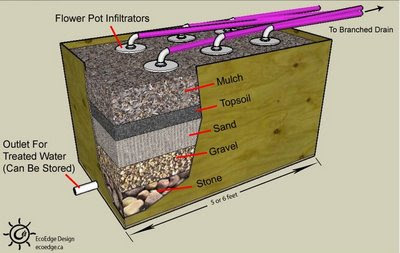 Place the pot on the gravel, or if you use mulch, rest the pot on some bricks to keep the pot from sinking into the mulch. Then cover the rest with mulch. The diagram show the tops exposed, but they can be buried in mulch. Straight greywater cannot be stored for long before it will stagnate and become a smelly health hazard. Once it is treated, however, the water can be held in tanks for later non-potable use. 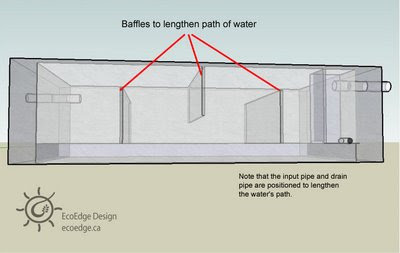 The design below illustrates a simple system using the technique just described to treat water that can be used downstream in the system. The entire unit can be built into a water proofed plywood box or a constructed ferro-cement box. 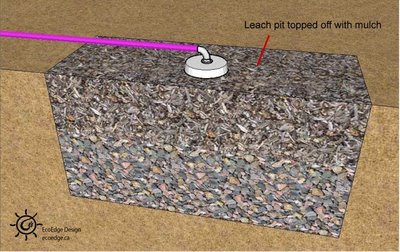 These leach fields are a convenient solution for cold climates. Outdoor greywater systems need to be shut down in winter as they would freeze up. Leach fields, however, can be incorporated into a greenhouse. Furthermore, any warmth from the use of hot water can be transferred to a greenhouse rather than wasted in the septic or sewage system. Another option for the treatment of greywater that lends itself well to greenhouses is the constructed wetland. 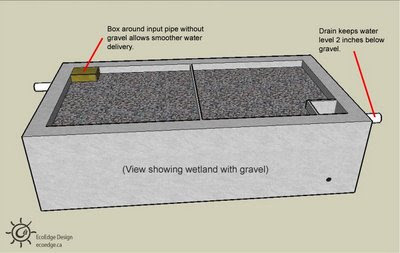 This system is also an option for very wet areas where the ground is too saturated to accept additions of greywater. 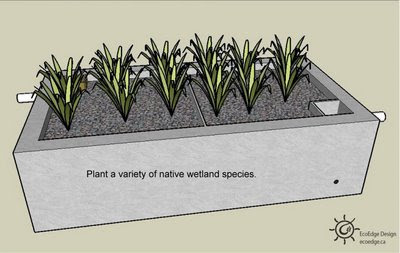 The water exiting the constructed wetland could be used for irrigation purposes or could go into an aquaculture system. One square foot of wetland surface area will be enough to treat one gallon of water. So, if you produce 50 gallons from one source, you will need 50 square feet of wetland surface area. 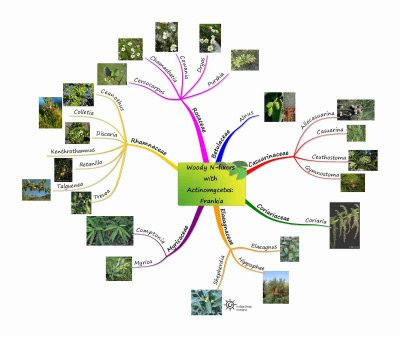 The fine tuning of these systems can be a bit tricky as nutrient supply determines how many plants can survive. If the system is in a greenhouse, it will be simpler as you do not need to consider the amount of rainfall you can expect to receive. And if the system is too big for the nutrient supply, this can be remedied by controlled additions of actively aerated compost tea. If your system is to drain outdoors, you will need to check if your soil is capable of handling the load. Dig a 30 cm (12”) deep hole about 10 or 15 cm in diameter. Fill the hole with water 2 or 3 times to saturate the soil. 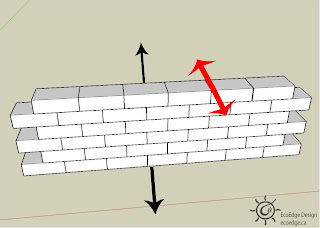 Then place a stake with marks denoting distance (in inches or centimetres) in the hole. Fill the hole with water and time how long it takes for the water to drain down. 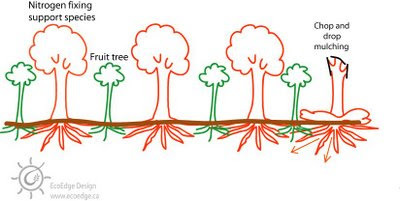 It will give you the inches or centimetres per minute that the soil is capable of handling. If you are building a new home, do not mix greywater pipes with blackwater (from the toilet) pipes, including the vents. This makes implementing a greywater system easier. Also, implementation will be easier if you design your greywater pipes to conserve vertical drop as the system will be gravity fed. Use between 2 inch and 1 ½ inch pipes. Any smaller and clogs are more likely. Any larger and solids might stick on the bottom of the pipe. Be careful to keep the slope of all the pipes in the system at least 1:48 (1 cm drop over 48 cm, or ¼” drop over one foot) or steeper. And less and you risk clogs forming in the system. 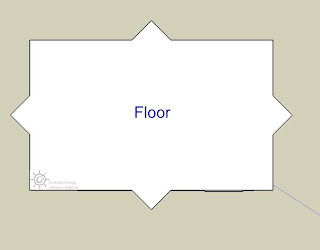 Also design the final outlet to empty the water with a fall of several inches. This will prevent solids from backing up at the end of the pipe and clogging. 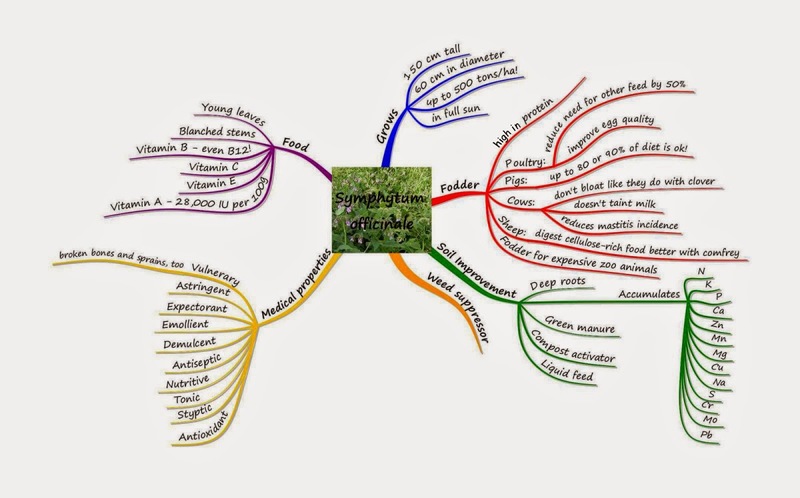 Map out the system for future maintenance, and be sure to incorporate easily accessible cleanouts.